Although this stamp is widely seen by many, including myself until recently, as the world's first commemorative stamp, I am indebted to Henry Marquez for pointing to the evidence that the 5c Trencito does not hold this distinction. He has provided me with a translation of the summary of the story of this stamp in the "Catalogo especializado de las estampillas del Peru" 1981, by Casa filatelica Bustamante (Lima, Peru), to whom I am grateful for their permission to reproduce Henry's translation. Henry has also added some further detail, based on his own research. On December 29,1865 a half price postage reduction was given to all mail transported by train between the cities of Lima, Callao & Chorrillos. At that time the minimum postage charge was 10 cents (Un Dinero) so the new railroad rate was reduced to 5 cents. [This is the reason why the 5 cents green stamp of 1866 was issued, and the reason why there are covers with bisects of the Un Dinero rose stamp]. The Trencito has several distinctive features. Foremost is the fact that it was printed on a Lecoq machine, imported from Paris, a feature which provides much of the stamp's philatelic interest. The Lecoq machine was effectively an embossing machine through which a single strip of gummed paper was passed. This strip was only one stamp high and the machine 'printed' each stamp individually. In general, the upper and lower margins are quite close, often just touching either at top or bottom, if, as often seems to have been the case, the strip of paper was fed through at a slight angle. These upper and lower margins may be found with small pin holes, suggesting that some mechanism was used to produce an accurate horizontal separation between the stamps. The side margins are quite generous; in perhaps 85% of cases with this stamp, if it is not 4 margins, it is the top or bottom margin which is broken. Whilst the 2c blue of 1872 showing a llama, fed vertically through the Lecoq machine, can only exist in vertical multiples, the 5c train stamp, popularly known as the 'Trencito' can only be found in horizontal multiples, the largest known strip being, I believe, six stamps (mint). Another unusual feature of this stamp is the 'coil join', a form of shorthand describing a stamp printed across the join of two strips. When the strip ran out, the 'printer' (if that is not too grand a title!) apparently just stuck on another strip - and carried on printing. This gives rise to stamps printed across a paper join. They may appear defective to some eyes but are in fact, to my mind, particularly collectable and worth a premium. I have never seen a mint coil join (more correctly strip-join) but used ones do appear from time to time. If I had to take a real guess, I would suggest a join appears perhaps every 20-25 stamps, but that is solely based on the frequency with which I encounter them. They are not too uncommon on cover and reasonable covers fetch from perhaps about £45 upwards. They may be found pen-cancelled although the majority are postmarked. 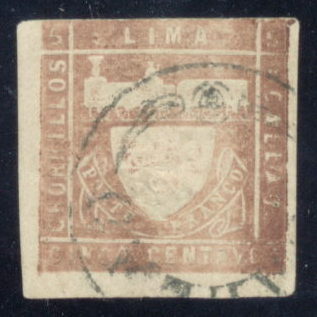 Cancellations may be straight line (PAITA, for example, in the fourth stamp in the scan below), dumb cancels (second stamp), shipping line cancels (stamp 4 of row 2), town names within a lozenge of dots (stamp 3 of row 2). Other cancellations include circular dated town cancels, boxed straight-line cancels and C38 of the British Postal Agency in Callao, Peru. As always with colours, you do not have to agree with my descriptions! Stamps 6 and 9 are slightly different shades again but are illustrated for different reasons. 6. An example of a strip join, the join looks like a crease through the 'L' of 'LIMA', extending down to the right of the word 'CINCO'. 9. P.S.N.C (Pacific Steam Navigation Company) cancel, I believe. The 'CALL' and 'ALLAO' varieties (7 and 8 above) are listed as such by SG and footnoted by Scott, who describe these varieties as being due to over-inking. Altogether a most fascinating and attractive stamp, even if its claim to being the world's first commemorative stamp is not supported by the facts. As a very early railway thematic, I think only preceded by New Brunswick and the USA in the chronology, I commend it unreservedly to all railway thematic collectors.